Officers Colin Lewis and Brad Smith (center) on patrol near a park in Huntington Beach, Calif. 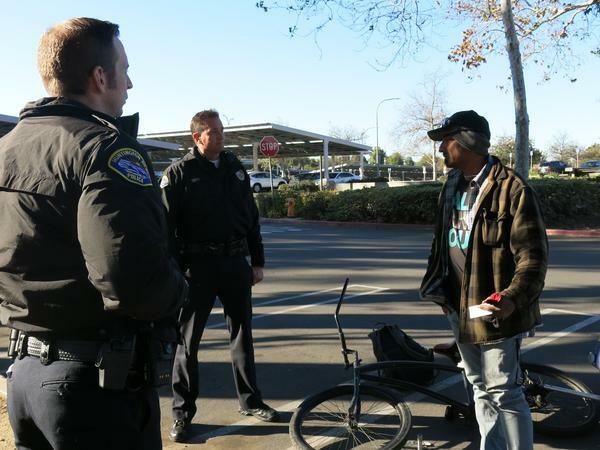 The area has seen a sharp increase in homelessness and petty thefts, which the officers blame on Proposition 47. But the law's supporters say other California cities have seen declines in property crime. 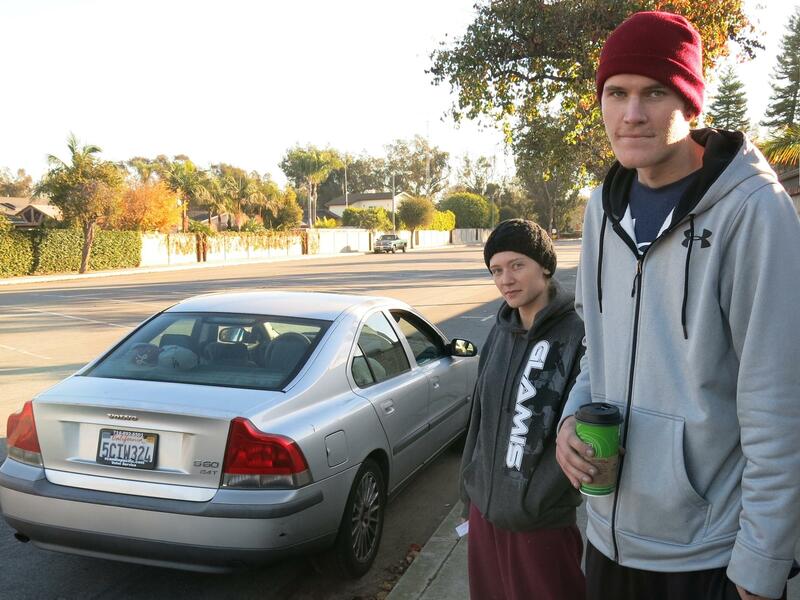 Sierra Meysami and Tov Johnson in Huntington Beach, Calif. Local police arrested them in late November for having heroin, meth and stolen property in this car. They were booked into jail, but because Prop 47 reclassified their alleged offenses as misdemeanors, police say, they were released within hours. Meysami says Prop 47 is an improvement, because jail time is "too much for drug addicts." Let's look now at what happens when you put fewer lawbreakers in jail. Voters in California approved an experiment in 2014 when they approved Proposition 47. It reclassified some nonviolent felonies as misdemeanors. The law has been in effect for a little more than a year, and there are fewer people behind bars, but some police say there's also more crime. NPR's Martin Kaste reports. MARTIN KASTE, BYLINE: Brad Smith is a police officer in Huntington Beach. It's a decent-sized town on the coast of Orange County. He's eager for me to meet some of the drug addicts who live in the street there. KASTE: He pulls up behind a parked Volvo. This car is pretty much home for Sierra Meysami. She's a slightly built, sharp-witted woman who says she first tried heroin at age 18. Now she's 23, and she's completely hooked. SIERRA MEYSAMI: I used to cry right before I'd use just because I felt like I had to use in order to feel normal. KASTE: She's a good example of someone who would be in jail right now if it hadn't been for Prop 47. One of the crimes that reclassified is possession of heroin. Now that it's a misdemeanor, it's easier for her to stay out of jail. And she thinks that's as it should be. MEYSAMI: I personally think in jail, I mean, it's just such a intense consequence. It's too much for, let's say, you know, drug addicts. KASTE: But, Officer Smith sees it differently. A couple of weeks earlier, he says he caught Meysami and a friend with heroin and stolen property in this car. He arrested them, but they were back out on the street before he could even finish the paperwork. SMITH: So in essence, what's happening is they're getting released the same day I arrest them. There's no incarceration time before they go to court. And then if they do, are found guilty, the time that they have to do for the crime is also less. KASTE: He thinks when addicts are out on the street more, they steal more. He points to increases in auto theft, car prowls and garage burglaries. They're all up 20 percent or more in Huntington Beach since Prop 47. Some other California cities are also seeing some upticks, and a lot of police are grumbling. At the ACLU of California, Margaret Dooley-Sammuli is well aware of the cops' hostility toward Prop 47. MARGARET DOOLEY-SAMMULI: I have certainly heard perspectives that perhaps there are some in law enforcement that are still running an opposition campaign to Prop 47. So that's certainly a perspective that's out there. KASTE: She says the critics are ignoring other California cities where property crime is stable or even declining. Statewide crime stats are not available for 2015 yet, and she says nobody should be jumping to conclusions. There are other people, though, supporters of reform, who say it is worth keeping an eye on these localized crime spikes. MAGNUS LOFSTROM: I don't think it is right to just brush it off as being nothing. KASTE: Magnus Lofstrom is a senior fellow with the Public Policy Institute of California. He's also waiting for statewide statistics, and he says we can't yet judge the overall effect of Prop 47. But he recalls that a similar prison release a few years ago did push up the number of auto thefts. And he says reformers need to be honest about the possible negative consequences of letting people out of jail. LOFSTROM: It is important to recognize that it might have an impact in crime. It might very well have an - put some upward pressure on crime rates. And the key, then, is to think of what are, then, the alternative strategies. KASTE: Reformers say the justice system needs time to retool itself, to figure out, for example, how you get drug addicts into treatment without the threat of prison time. In downtown Huntington Beach, police chief Robert Handy mixes his criticism of Prop 47 with an acknowledgment that he's now expected to do things differently. ROBERT HANDY: It's a pretty big hill to climb when, for us as police officers, our - the old way of handling that's just putting them in jail. But we can't do that anymore. KASTE: So they are trying other things, such as dedicating one of their officers to working with the homeless full-time. But chief Handy says that people should also remember that American police have spent the last two decades cracking down on these quality-of-life crimes because that's what society wanted. And he says he'll be interested to see the reaction if petty crime goes back up. Martin Kaste, NPR News, Huntington Beach, Calif. Transcript provided by NPR, Copyright NPR.